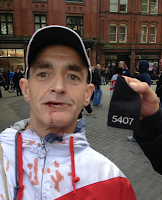 With the EDL crying in their pints and declaring that police brutality was the order of the day in Walsall (yesterday), at least one EDL activist is prepared to tell the real truth regarding how most of their injuries were caused. 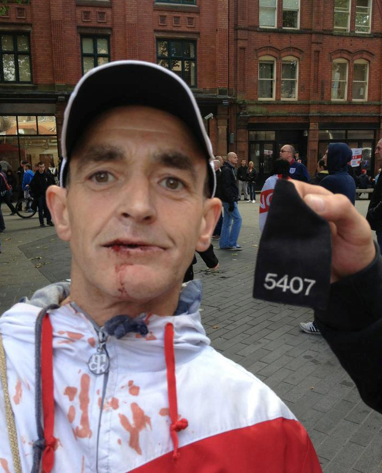 Simon Blewitt from Chessington, Kingston Upon Thames admits that the behaviour of the EDL in Walsall today was as violent as ever and that his and others injuries were in fact inflicted upon themselves. 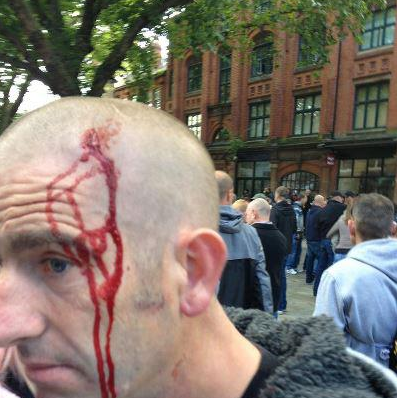 Members of the English Defence League (EDL) clashed with police in the Midlands town of Walsall on Saturday. Twenty-eight arrests were made, according to West Midlands Police. 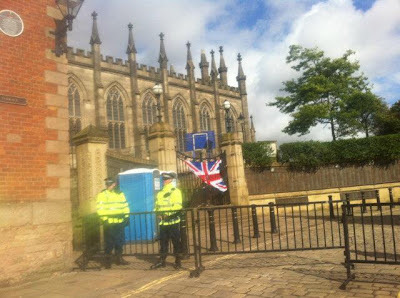 Huge numbers of police were deployed in the town centre to keep order as members of the far-right group staged a protest against “militant Islam”. According to the Birmingham Mail, missiles, including “bricks, bottles and litter bins” were thrown at the police as skirmishes broke out during speeches by members of the EDL. Officers with shields and batons cleared the town centre by charging at the demonstrators. Members of the right-wing group were forced back onto buses to stop further clashes. 'We go where we want, when we want' was the battle cry from the English Defence League yesterday. 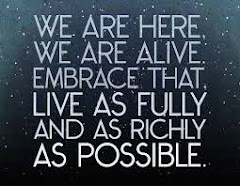 In reality they go to where the police tell them to go when the police want them to go there. They claim to be taking the streets back but in three years they have yet to take one street back. Today was no exception in Walsall when a paltry turnout of 150 tried to attack hundreds of counter protesters but were stopped by police. Getting bored of speeches by Tommy and Kev, EDL members decided it would be a good idea to pelt the police with bricks and bottles and try and charge their lines so the police decided to give them them a good battering, leaving over 30 'patriots' injured. Several have asked about the We Are Norwich plans to counter the messages of hatred and division from the EDL. (W)e only found out the confirmed new date last week! The (date) for the Public Meeting will be Wednesday 24th October - am confirming the venue on Monday. We have said all along we will have a counter-demo, that came out in the article in the EDP last week and it's in our "what we stand for". To be honest - the details about that won't come out until nearer the time because we are in dialogue with the police and the EDL haven't yet said anything other than there is a demo. By the middle of next week we should have a) confirmed the public meeting, b) launched the press release and c) released a vague statement re: the counterdemo. Thanks, Nick, there is certainly a lot of determination to confront the excesses of the far right in our fine city of Norwich, and it is in everybody's interest to keep the opposition planned and orderly. As you can see, huge rally here. Nutzis, now is the winter of your discontent. Modern Norfolk is not hospitable to the far right. In July 2009 the BNP's fake cleric Robert West was sent packing from Norwich North, and in May 2010 eight BNP candidates stood for elections here and eight BNP candidates lost their deposits. 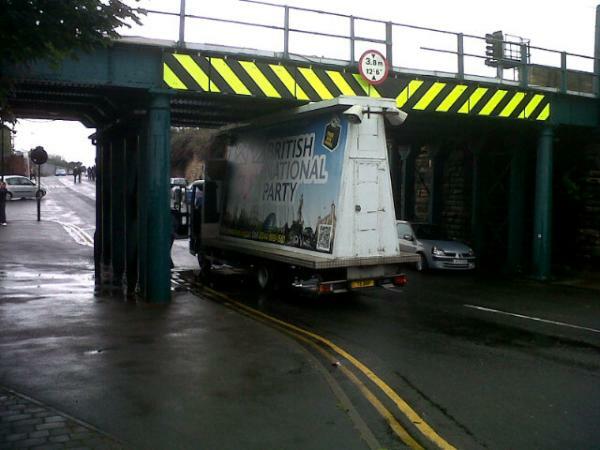 The BNP were banished from our region. 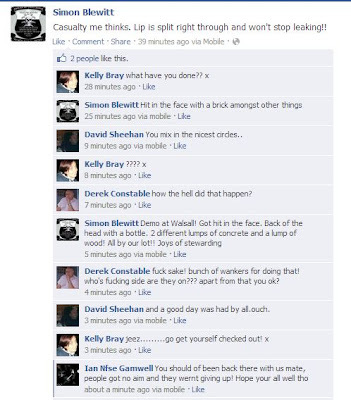 The EDL will be the next to go. 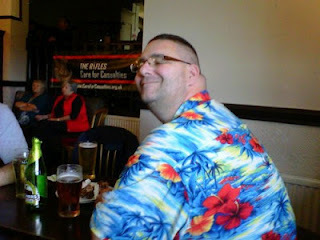 For example, the following article from earlier this year describes how the Marlpit pub's owners on Hellesdon Toad, Norwich banned the EDL from meeting there. Meetings of the controversial English Defence League have been banned at a Norwich pub after a string of complaints. About 45 members of the group, which is associated with violent demonstrations, have met at the Marlpit pub in Hellesdon Road. No trouble was reported and another meeting was booked for last weekend. But after complaints about the meetings from an anti-EDL group, the pub’s owners, Enterprise Inns, banned the EDL and the meeting was cancelled. A spokesman for Enterprise said the licensee had been “reminded of their obligations”. She said: “We have spoken to the publican, who we understand has instructed pub staff to ensure no further meetings of the English Defence League are hosted at the Marlpit pub." 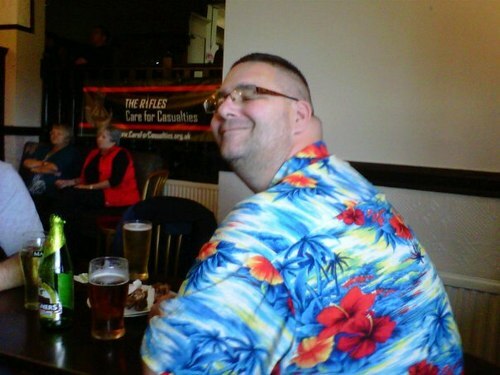 It is understood the pub agreed to let the EDL hold the first meeting, but after receiving emails complaining, Enterprise Inns urged the landlady to not allow any more meetings. Green Party councillor for Wensum ward, Lucy Galvin, said she was concerned by the EDL activity in the area. “Norwich has a long and proud tradition, stretching back centuries, of welcoming people of many faiths. The EDL, which has an East Anglian division, has attracted controversy since forming in Luton in 2009. On its website the right-wing group says it protests “peacefully”, but its marches are often marred by violence and arrests, along with counter-protests by anti-fascist groups and trade unions. The Norwich division of the EDL, which has 75 members on its Facebook page on the internet, is also planning a march through Norwich (in November). On its website, the EDL lists the banning of Reverend Alan Clifford of the Norwich Reform Church from using a market stall on Hay Hill as one of the reasons its planned march. The church was banned from using the stall by Norwich City Council after a complaint it was publishing “hate-motivated” leaflets. No one from the Norwich branch of the EDL could be reached for comment (). 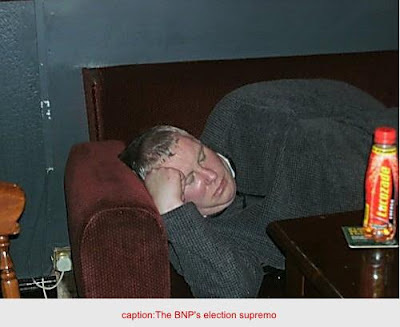 Clive Jefferson, the election manager for the BNP, loses yet another by-election for the party. He's not the greatest advertisement for Lucozade energy drink. The Electoral Commission has fined the British National Party a total of £2,700 for the late delivery of its statement of accounts for 2010. There were two fines. The first fine of £1800 was imposed on the central party for its failure to provide accounts by the deadline of 7 July 2011. A second fine of £900 was imposed on the party’s regional accounting unit for failing to deliver its accounts by the same deadline. The party co-operated with the Commission and both accounts were received on 21 February 2012, in accordance with a deadline set by the Commission. Both fines have been paid in full. “People have a right to know how parties are funded and how they spend their money. The British National Party has repeatedly failed to deliver accounts for the central party and its accounting unit on time in the past. For further information please contact Rosemary Davenport, Media Relations Officer, on 0207 271 0704. Out of office hours: 07789 920414. THE NORFOLK AFRICAN COMMUNITY ASSOCIATION (NACA) INVITES YOU TO AN OPEN DAY IN CELEBRATION OF AFRICAN DIVERSE CULTURES. Time: 11a.m. – 4:30 p.m.
Food suitable for vegetarian will be available by ticket @ £3.00 per ticket between 12:30 - 2.00 p.m.
Below are the points of agreement and who has signed up so far. 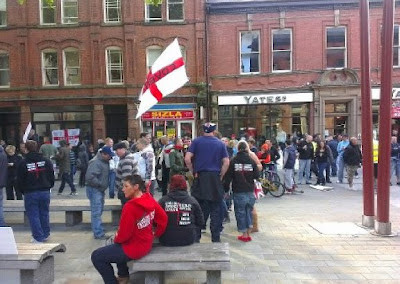 We strongly oppose plans by the English Defence League to demonstrate in Norwich on the 20th October. We believe that Islamophobia or bigotry against Muslims is as unacceptable as any form of racism and are strongly against any scapegoating given the backdrop of economic depression, unemployment and public spending cuts. We believe that the EDL are a racist and fascist group with many links to the BNP (including their leader Tommy Robinson, real name Stephen Yaxley Lennon of the BNP who has a string of convictions for violence). We fear that if the EDL come to Norwich there will be fear, violence and disruption to local business. 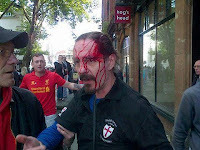 We note that the EDL have recently disrupted Trade Union events, threatened Black and Asian people and attacked LGBT people at a Pride event in Bristol. 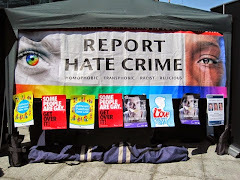 We find it deeply hypocritical that the EDL are coming to Norwich because of the banning of a stall run by the Norwich Reformed Church -whose literature is Islamophobic and are the only group ever to protest at the city's Pride event. We will do all we can to prevent the EDL from coming to Norwich by leafletting and stalls/ exposing them through the media/ online/ holding multicultural events in the city/ a LoveMusicHateHomophobia gig at Open and public meetings. If the EDL still decide to come we will organise a peaceful counter demonstration in the centre of Norwich, working with the police and the local authorities. We are Norwich (click for webiste) is a coalition of individuals, representatives from political organisations, community groups and faith groups to oppose the visit of the English Defence League (EDL) to Norwich later this year - we will keep you informed. We are Norwich (click for Facebook) plans to do all that it can to prevent the EDL from coming to Norwich - by organising stalls in the city, public meetings, and gigs. If the EDL does decide to come we will organise a safe and peaceful counter demonstration to show the EDL that they are not welcome and to celebrate multicultural Norwich.